Here’s a summary of discussions at the ELC USA and EMEA meetings about digital transformation. One of the first themes is the use of deep learning to displace the need for metadata, and records management being replaced by automation to a large extent. 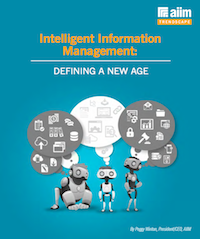 One of the big drains on information management has been the need for people to classify information and store it appropriately. This feels like it has become harder as the volume and diversity of information has accelerated. People aren’t good at organising content. The industry built systems that required considerable manual intervention, asking a lot of the people that used them. Real progress is now being made and that has the effect of making data more valuable. In healthcare there have been many initiatives such as telemedicine, emergency room avoidance techniques, insurance and healthcare at home. They all helped to varying degrees but never delivered their full promise. In the U.S. healthcare cost $3.2 Trillion in 2015, and much of that relates to hospital services. Smarter use of data is making big inroads into those costs, and parallels can be drawn with many other sectors with lots of people, assets and resource constraints. So what areas are bringing the improvements? Great insights provided by Optum Technology that generated ideas for everyone. The presentations moved on to consider legal implications of handling and analysing data. This is a vital subject to tackle due to the personal rights, financial risks and legislation that is having to adapt fast to a digital age. Business models need to be based on using data in a valid and legal manner, then ensure that it is protected. We heard in detail about the Equifax breach and this just underlined how vulnerable many organisations can be, and the risks they may expose us to. Technology won’t fix all this but the potential exists to shift information ownership and control more in the direction of the people the information belongs to. Such shifts rely on systems that can be made sufficiently open on the one hand, but extremely secure on the other. This isn’t just about protecting access to information, it’s about the trust and truth of the information. Blockchain technologies are developing fast and hold great promise in this area. It is highly appealing to avoid dependence on any specific agency when it comes to our information. Even the largest corporations can get into bad information handling situations, we need people to be able to take back more control and restore faith in our information. That gives us a more stable basis for value and benefits through applying AI and other smart technologies to that data. Corporations won’t have to build all these things, they will start appearing within services and solutions. 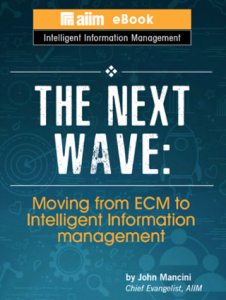 The shift from Enterprise Content Management to a more federated, agile and open model continues – which we refer to as Content Services. This concept is worth looking into for your organisation as it moves away from dependence on a few centralised systems into a more app-based architecture where information can be more freely shared across systems. This model enables more rapid delivery of value, can be more iterative, at lower costs and permits lower risk evolution. The point of all that is to let businesses transform and adapt to new operating models more effectively. So, we can all get carried away with the marvels of new technology. One effect we looked at is the lag in customer experience. The tools may be awesome but people are confused as there are so many in use in our day to day lives. Apart from line-of-business apps it is common to be using LinkedIn, Yammer, Teams, Skype, Twitter, Outlook, Webmail, GoToMeeting, Evernote, Box, Dropbox, OneDrive, Office365 apps, perhaps Google apps too. People are jumping between a bewildering array of apps to ‘get stuff done’. Those apps change, often fast and get replaced by end users themselves not just via IT. The big pushes are going to come in overall user experience, which starts to pull things together way more effectively. That’s something Facebook has worked on with its internal Workplace tech, now available to everyone. They are all about the experience, but all the other vendors are working hard on that too. If you aren’t putting your focus on customers and users then the tech will fail to make the impact you expect.